Every fall, 40 second-year medical students from the University of Saskatchewan College of Medicine move to the Regina Campus based at the Regina General Hospital. Part of their education is a module called “Arts and Humanities,” which gives the students a chance to approach medicine from different perspectives such as life drawing or photography. A stream within this module is the history of medicine. This year, the College of Medicine teamed up with the Civic Museum of Regina to explore the collection of Regina General Hospital artifacts at the museum. Guided by the curator, the students chose artifacts, researched the history behind them, and wrote an interpretive text from different perspectives. 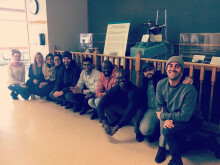 You can visit the student curated display from March 5 to April 30 in the Cafeteria located on Level 0 of the Regina General Hospital and see how the students chose to reflect on historical medical practices and to explore different points of view. April is Letter Writing Month, and we've teamed up with Paper Umbrella to celebrate! Visit Paper Umbrella throughout the month of April to experience #write_onYQR: an interactive display that features postcards--some over 100 years old--with photos and drawings of Regina's historical buildings and landscapes. Take part in Paper Umbrella's daily letter writing challenge by filling in a postcard from the past or simply browse through vintage images of the City of Regina. The postcards will be displayed in the store until the end of April, at which time they'll be mailed out--all over the world! Paper Umbrella is located at 2724 13th Ave. This Letter Writing Month display is part of the Civic Museum of Regina's ongoing Collection Revival efforts. Visit Escape Club Escape Rooms & Board Game Cafe for an interactive ecomuseum experience! Running through 2019, Something Board, Something New takes tabletop games from the Civic Museum of Regina's collection and reintroduces them to the public as part of the museum's Collection Revival efforts. Play a Canadian made game of Snakes & Ladders or ask the Crystal Ball about your love, life, and finances! Escape Club is located at 2410 Dewdney Ave.